Start Time Team choice. Between Thur noon and Sat 10AM. Rooms: Several rooms have been reserved (Bunk and Queen). You can call and request that one of the rooms be placed under your own name and credit card. 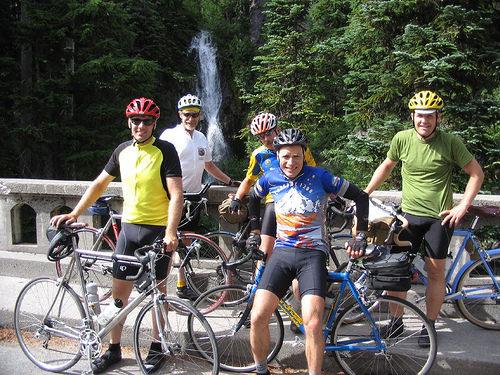 The group is "Oregon Randonneurs." Any remaining rooms are released on, Apr 5. Entry Fee: $10 per rider, Oregon Randonneurs membership required. Special Note Route Approval: Send the electronic form of your route to the Route Coordinator for approval. Send the team application, release forms, membership forms and fees to the RBA at the address on the application form. The RUSA website has detailed information regarding Fleche events. Please read this information before submitting your questions to the organizer. If you plan to spend the night at the Grand Lodge, make reservations soon as May is a popular "Wedding Time" at the lodge. Why do we always pick the Grand Lodge??? Check it out! We have a breakfast reservation at the Ironwood Grill, Grand Lodge for Sunday at 9AM. This is no-host. Plan to share your tales with other teams and see what surprises our Master of Ceremonies has up his sleeves for our very first Flèche. Go over the rules of team events with your team. In particular, team members should note the location and distance of their 22 Hr Control. Team members must complete a minimum of 25km in the last 2 hrs of their event. And most importantly, team members must finish together in the 24th hour. Do not leave your teammates in those final 2 hours.